A VLAN is a group of end stations in a switched network that is logically segmented by function or application, without regard to the physical locations of the users. Any switch port can belong to a VLAN, and unicast, broadcast, and multicast packets are forwarded and flooded only to end stations in that VLAN. Each VLAN is considered as a logical network, and packets destined for stations that do not belong to the VLAN must be forwarded through a router. VLANs are numbered from 1 to 4094. All configured ports belong to the default VLAN when you first bring up the switch. The default VLAN (VLAN1) uses only default values. You cannot create, delete, or suspend activity in the default VLAN. VTP is a distributed VLAN database management protocol that synchronizes the VTP VLAN database across domains. A VTP domain includes one or more network switches that share the same VTP domain name and that are connected with trunk interfaces. 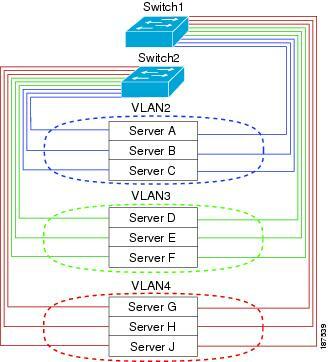 VLAN 1 is required on all trunk ports used for switch interconnects if VTP is supported in the network. Disabling VLAN 1 from any of these ports prevents VTP from functioning properly. If you enable VTP, you must configure either version 1 or version 2. The show running-configuration command does not show VLAN or VTP configuration information for VLANs 1 to 1000. VTP pruning is not supported. You must enter the copy running-config startup-config command followed by a reload after changing a reserved VLAN range. VTP server mode and VTP client mode are not supported. The only supported mode is transparent mode, which is the default mode.